The CPA went to Court to get confirmation on its legal status. After a drawn-out court battle in the Land Claims Court and the Supreme Court of Appeal, the Constitutional Court heard the case on 28 May 2015. 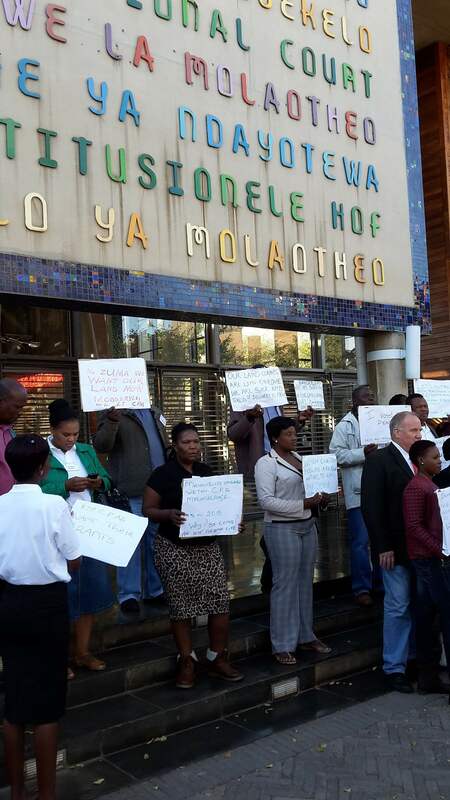 Members of CPAs and land claimants protest in support of the Bakgatla ba Kgafela CPA outside the Constitutional Court in Johannesburg (2015). In the Constitutional Court, the parties raised arguments about the legal status of the CPA. The Bakgatla ba Kgafela CPA argued that it should have been permanently registered because it substantially complied with the requirements for permanent registration in terms of the CPA Act and that, if the Department had not failed in its duties, it would have been permanently registered. The traditional council argued against this interpretation, saying that whether or not the CPA should have been permanently registered, it was registered as a provisional CPA – which, it argued, could only exist for a period of 12 months. The traditional council argued that because more than 12 months had passed since it was first registered, the CPA did not exist anymore. While an important part of the case, the technical arguments about the legal status of the CPA were not the central focus of the Court. 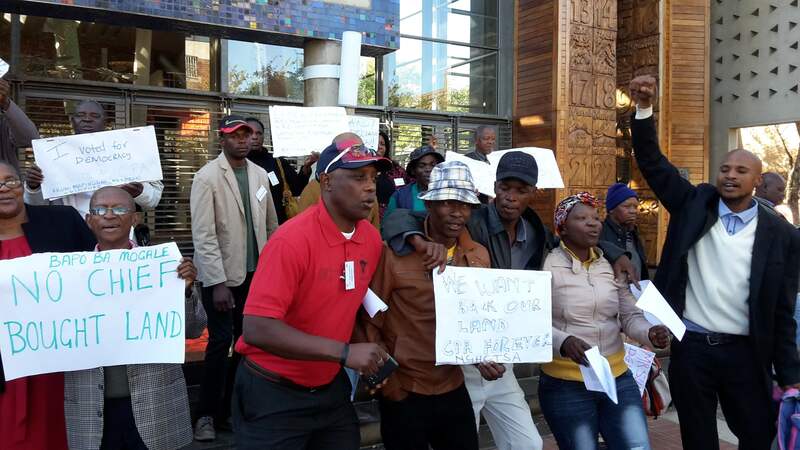 The Court instead focused on the Department’s failures and the impact that its decision would have on the restitution of land to the community. This is about access to land, not the rules of the court. Shouldn’t there be certainty for this community? Seven, eight years after their restitution claim? … When will these people get to own their land and start to work on it and to benefit from it? When asked what should happen to the land restored to the community, the CPA argued that if the Court found the CPA no longer existed, the land would revert back to government. This would have the effect of “denying the community their constitutional right to restored land”. Does that not go against the adage that ‘kgosi ke kgosi ka morafe’ meaning that ‘the chief goes by the majority of the tribe’? The Department’s lawyer said dismissively, “yes, there is this saying around”, which resulted in mutters from around the court room. The Department, which had been invited to make arguments before the Court, said that the Court should order the parties to undergo mediation to find a middle-ground. The justices seemed unconvinced by this suggestion given that they community had already waited a long time for the right to manage and use their land. Justice Moseneke said that if the departmental officials had been “just a little more careful, we wouldn’t be here”. The Court reserved its judgment, which is likely to be delivered in the coming months. Traditional leaders try to undermine the establishment, functioning and legitimacy of CPAs. This is mainly because they see CPAs as challenging their authority. Traditional leaders do this despite the fact that claimant communities democratically choose CPAs as their preferred institution to hold land. Serious administrative mismanagement by the Department. The case highlights that the Department suffers from serious mismanagement in relation to CPAs and points to the fact that this mismanagement is more widespread than just the Bakgatla ba Kgafela CPA. The Supreme Court of Appeal criticised the Department, saying that its handling of the CPA’s registration was “unfortunate” and amounted to “a comedy of errors”. The court said that this was especially worrying because the community “relied on [the Department] for guidance”. These statements show that the Department has failed to provide the necessary support to CPAs to enable these entities to function effectively. With very limited support and oversight, CPAs cannot be faulted for their inability to fully comply with the strict provisions of the CPA Act and should not have to bear the negative consequences of the Department’s inadequacy. For more on the Bakgatla ba Kgafela CPA case, read our factsheet here. Michael Clark is a researcher in the Rural Women’s Action Research Programme, at the Centre for Law and Society, University of Cape Town.